So, you're ready to get started – fantastic! Here are your package options and prices. Please note that the larger the package, the greater the savings per session. There are no membership fees and no contracts to sign. All sessions and packages include advice and help with nutrition. We favor a low sugar, real food "paleo" approach to eating. And remember, all that is required is just one or two sessions a week. No other form of exercise is required. The rest of your time should be spent having fun! The hour long intro session includes a partial SlowBurn workout, advice on nutrition for fat loss and muscle gain and a detailed, computerized body composition analysis. If you pay by cash or check, you'll receive a 2% discount. All monthly payment plans have a three month commitment at the start. After the third month, payment plans can continue on a month to month basis. All sessions will need to be used within the month. If you need to put your sessions on hold for a vacation or illness, we will accommodate you. Adolescent obesity and diabetes is running amok worldwide. The causes of these conditions are not, as commonly believed, inactivity and too much dietary fat. And the cure for these, as well as for general robust health and improved athletic performance in kids, is strength training. 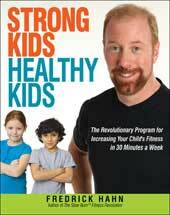 Strong Kids, Healthy Kids is for parents, caregivers and for kids. I wrote the book to dispel and shatter the long lived myths that surround weight lifting and to, once and for all, free children from the grips of obesity and diabetes as well as to enhance every aspect of their health and athleticism. The Slow Motion Exercise that Will Change Your Body in 30 Minutes a Week. Written by SlowBurn founder Fredrick Hahn and Michael and Mary Dan Eades, M.D., The SlowBurn Fitness Revolution: The Slow Motion Exercise that Will Change Your Body in 30 Minutes a Week (Broadway Books) includes a full explanation of the SlowBurn™ exercise approach, with pictures and diagrams showing how you can achieve total body fitness in just 30 minutes a week! Get a taste of what SlowBurn is all about. This is not the SlowBurn Fitness Revolution book in eBook form. It is a SlowBurn primer of sorts that will explain the method in detail plus some goodies and tips. The SlowBurn home workout is a safe, potent and exhilarating exercise program. It's so efficient, it can be completed in under 30 minutes just twice weekly! SlowBurn builds strength, increases muscle tone, and bone density, enhances endurance and provides all of the varied benefits that strength training provides. No other single form of exercise gives you so much. All you need is a TV or computer, a couple of filled water jugs or dumbbells, a towel and a fan. You'll feel stronger after just a few sessions. This is a quick and challenging toning and strengthening workout. No fancy equipment is needed. This program, along with our SlowBurn Power Eating plan (included as a complimentary gift) will give you a strong, lean and healthy body in just two 15 – 20 minute sessions per week in the privacy of your own home. Fred instructs some of the most prominent and famous people in the world at his studio in New York City. 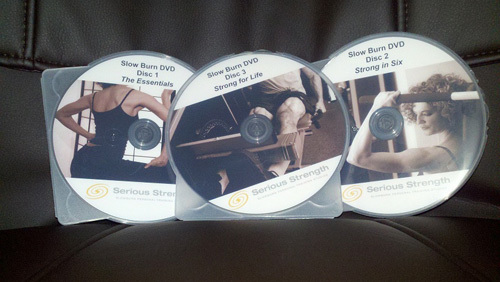 You can enjoy the powerful and efficient SlowBurn workout program in the privacy of your own home or in your gym! Now you've got the time!